Harris Schechtman, National Director of Transit for Sam Schwartz Engineering, was our guest for the final BWRC Breakfast Talk of the semester (Mr. Schechtman replaced Mr. Schwartz, the originally scheduled speaker). Mr. Schechtman, who has over 40 years of experience in the field of transportation design and operation, spoke about the Brooklyn-Queens Connector (BQX), a proposed streetcar line that would link Astoria, Queens to Sunset Park, Brooklyn. Mr. Schechtman, whose company has been conducting a study of the proposed line, presented a number of findings in favor of the BQX, arguing that it would ease congestion on crowded or near-capacity bus and subway lines; provide equitable access for Brooklyn and Queens residents to jobs along the waterfront corridor; enhance connectivity to already-existing transportation and infrastructure; and promote economic development overall. 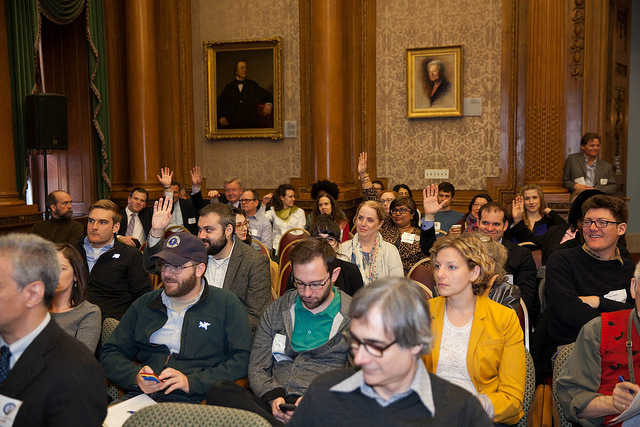 Despite the strong interest evinced by audience members, the proposal met with some skepticism from community members who are wary about its impact on Brooklyn Heights, Sunset Park, and other waterfront neighborhoods. Regardless, the event was successful in bringing together transportation advocates, urban planners, and community members, who turned out in large numbers despite the driving rain. We at BWRC look forward to planning events on transportation and other pertinent waterfront issues for the coming academic year. 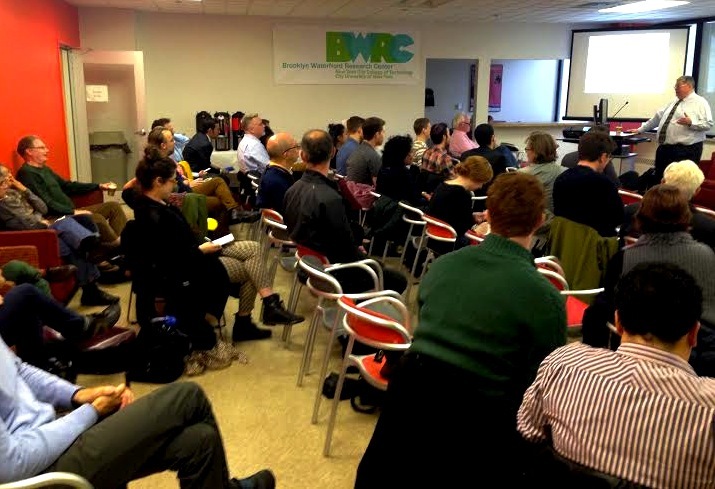 The BWRC Conference on “The Past, Present and Possible Future of Manufacturing Along the Brooklyn Waterfront” was a resounding success. Our best-attended conference yet examined the past, present, and future of industry and manufacturing on the Brooklyn waterfront, a topic which aroused considerable interest and generated some lively discussion. After opening remarks by BWRC’s Richard Hanley and City Tech President Russ Hotzler, Brooklyn Deputy Borough President Diana Reyna and City Council Member Carlos Menchaca set the tone with their impassioned calls for a return to policies that would preserve and add jobs to the recently revitalized waterfront. Reyna was the first of several speakers who recalled their personal connections to Brooklyn’s manufacturing past; her memories of her mother’s experience as a garment worker reminded the audience that only a generation or two separates us from a time in which a thriving manufacturing economy was an important source of local employment. Presentations by historians Julie Golia of the Brooklyn Historical Society and Aileen Chumard of the Brooklyn Navy Yard’s BLDG 92 also reminded us of Brooklyn’s rich industrial past and the ways in which waterfront history continues to shape the present moment. 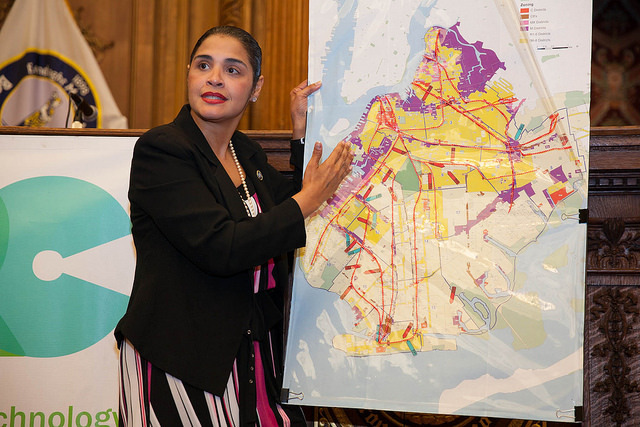 Pointing the way towards a possible future was Miquela Craytor, of the city’s Economic Development Corporation, who presented the city’s “Action Plan” for creating industrial and manufacturing jobs in the twenty-first century. Adam Friedman, director of the Pratt Center for Community Development, argued for a “high value” approach to urban manufacturing, one that could be achieved by technology, design, innovation, and aesthetic quality. Others spoke to the challenges inherent in bringing about a waterfront manufacturing renaissance, including the limitations of current transportation infrastructure, the imperatives of market-based real estate development, and the necessity of considering the needs of existing waterfront communities. 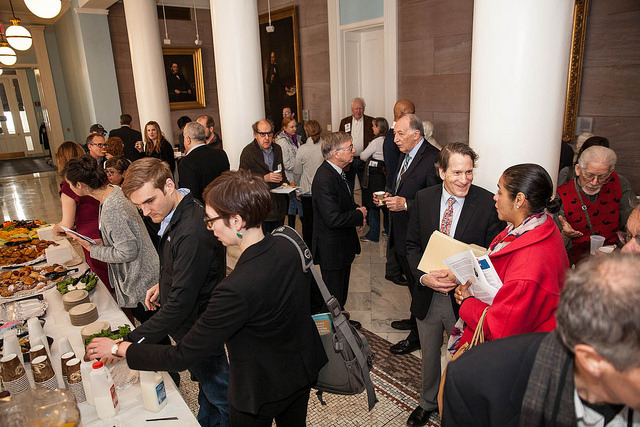 The rest of the day was divided into three panel discussions, on “Locations, Infrastructure, and Resilience,” “Jobs and Workforce Development,” and “Supporting Manufacturers in an Urban Environment.” Here we heard perspectives from entrepreneurs and representatives of small businesses, as well as from community organizations, academics, and policymakers. Queens College’s Tarry Hum had the final word with her look at the convergence between real estate development and immigrant communities in neighborhoods like Sunset Park. After the conclusion of the conference, a number of participants departed for a bus tour of the Brooklyn Navy Yard, a locus of revived waterfront tech-based industry that also provides a fascinating glimpse into Brooklyn’s industrial and maritime past. Thanks to all who attended and to all who contributed to making this year’s conference such a success. We at BWRC look forward to an equally stimulating and thought-provoking public discussion next year. Deputy Borough President Diana Reyna. 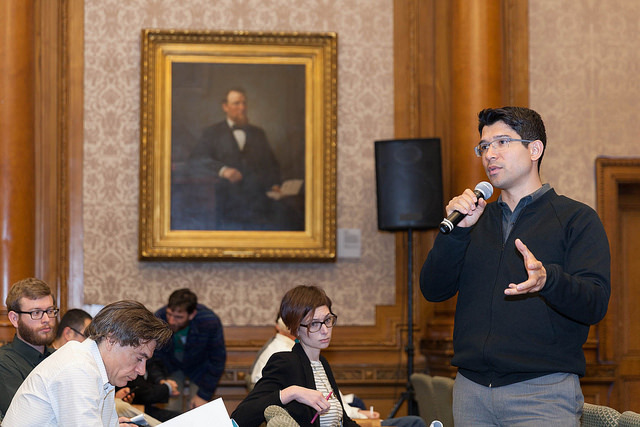 City Council Member Carlos Menchaca. Adam Friedman, the Executive Director of the Pratt Center for Community Development. Jocelynne Rainey of the Brooklyn Navy Yard. The crowd mingles in the corridors of Borough Hall. 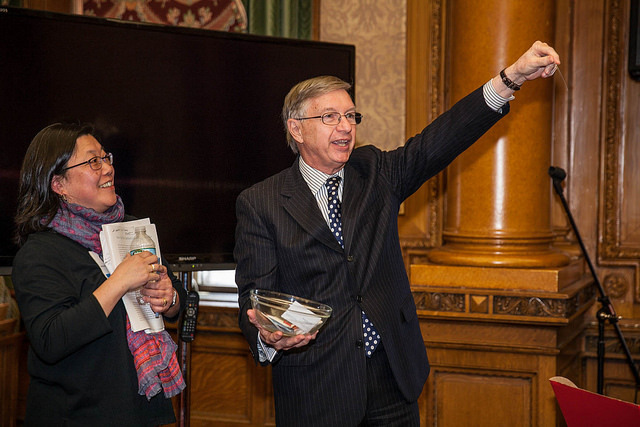 Queens College Professor Tarry Hum looks on as BWRC Director Richard Hanley announces the winner of a raffle for some exclusive Made In Brooklyn products. Navy Yard Building 128 during its midcentury industrial heyday. Photo courtesy of National Archives. For almost twenty years, the Brooklyn waterfront has been experiencing a renaissance propelled mainly by residential development. However, there have also been some manufacturing rebounds, or at least stabilization. 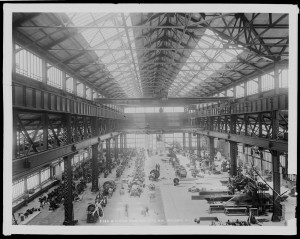 The history of manufacturing losses in Brooklyn stretches back to the mid-1950s. The declines continued into this century when, from 2000 to 2010, Brooklyn lost 55 percent (23,925) of its remaining manufacturing jobs. But since the current decade began, the decline has stabilized, and Brooklyn is no longer seeing decreases in manufacturing employment. Also, there has been a new vibrancy at manufacturing locations along the Brooklyn waterfront’s industrial corridor at places such as, the Greenpoint Manufacturing and Design Center, the Brooklyn Navy Yard, Industry City, Liberty View Industrial Plaza, and the Brooklyn Army Terminal. 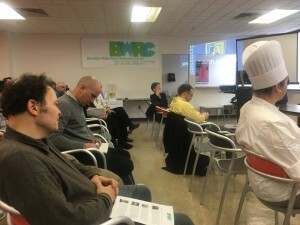 BWRC’s Fifth Annual Conference, “The Past, Present, and Possible Future of Manufacturing Along the Brooklyn Waterfront,” will examine whether these recent developments can lead to the growth of a new kind of manufacturing that will be sustainable, or whether they are just a slight interruption in an inexorable march toward residential development and service sector employment along the Brooklyn waterfront. Featured speakers will include Deputy Borough President Diana Reyna, Miquela Craytor of the NYC Economic Development Corporation, and Adam Friedman of the Pratt Center for Community Development. 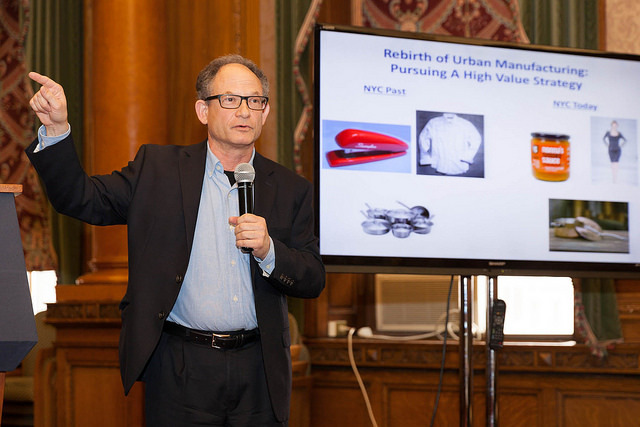 “The Past, Present, and Possible Future of Manufacturing” conference will take place at Brooklyn Borough Hall on April 8th, 2016, from 8:30am–12:30pm. The event is free and open to the public; you can RSVP for the event here. The BWRC held its first Breakfast Talk of the semester—and our first Breakfast Talk Panel conversation ever— on Friday, February 19th. 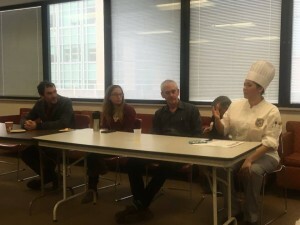 We were pleased to present a panel of four highly-qualified experts on a topic that has been steadily garnering attention over the last decade: the rise of urban farming initiatives in Brooklyn and beyond. As our panelists made clear, some of the most innovative and exciting urban farming projects have been taking place in Brooklyn, often in waterfront areas where (until recently) under-utilized space was readily available. As BWRC director Richard Hanley’s opening remarks reminded us, the challenge of providing nutritious and sustainably grown food to a growing urban population remains a global one. 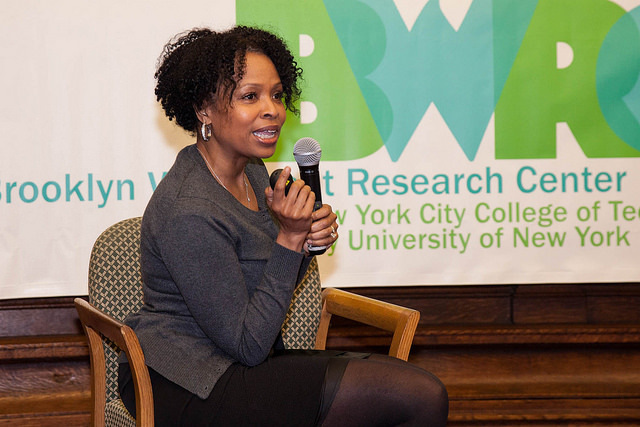 Our first speaker, Diana Mincyte, an assistant professor of sociology at City Tech, helped place Brooklyn’s current urban farming projects in this global context. Mincyte, who has written widely on the environmental and social justice dimensions of agro-food systems in Europe and the United States, contrasted the current vogue for urban farming in Brooklyn to cities in Eastern Europe. There, vegetable gardens and small-scale farming are commonplace, if not always viewed in the same favorable light that has generally accompanied the rise of urban farms in American cities. 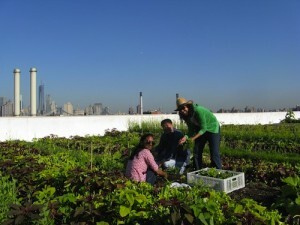 Ben Flanner, the CEO, head farmer, and co-founder of Brooklyn Grange—currently the largest soil-based rooftop farming operation in the world—described some of the challenges inherent to urban farming generally as well as some of the specific hurdles his company has faced on its way to becoming one of the most successful rooftop farms in the country. As Flanner pointed out, structural and other building considerations, issues of space in densely-concentrated urban neighborhoods, and skyrocketing real estate costs all pose significant obstacles to the viability of urban farming in Brooklyn. That established, Flanner described his company’s successful mission to create a sustainable, environmentally-friendly, and profitable urban farm, as well as its recent efforts to branch out by providing landscape consulting, event hosting, adult education classes, and other educational and community ventures. 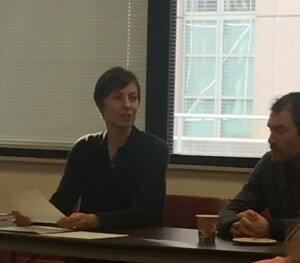 Mara Gittleman, the farm education manager at Kingsborough Community College, CUNY, spoke passionately and eloquently about her work integrating farming and gardening skills into the KCC curriculum. 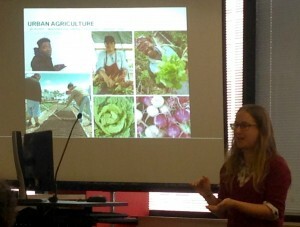 Describing the historical context that has shaped the built environment and affected the underprivileged communities where green spaces are most needed, Gittleman set up a contrast between the suddenly “buzzworthy” urban farms and the city’s community gardens, which are still largely unprotected and unrecognized by city authorities. In addition to her work as an educator, Gittleman continues her advocacy for community gardens as the founder and co-director of Farming Concrete and as a member of the board of directors of the NYC Community Garden Coalition. Lastly, Mark Hellermann of City Tech’s Hospitality Management program spoke about his experience as an instructor of culinary arts and as the advisor to City Tech’s Garden Club. Underscoring the challenges posed by Brooklyn’s booming real estate market, Hellermann described the demise of the Garden Club’s former growing space on DeKalb Avenue, now replaced by a high-rise construction site (more felicitously, the Club now rents a plot from Brooklyn Grange). Hellermann also invited one of his students, Caroline Carreno to speak about her experiences both as a student in the Hospitality program and as the vice president of Garden Club. A lively question-and-answer session followed the four speakers, as audience members contributed a wide variety of backgrounds and perspectives to the conversation. The Hospitality Program provided an array of pastries and delicious jams made with fruit grown by the Garden Club, providing a tasty illustration of some of the educational possibilities that urban farming initiatives can help foster. Although the current urban farming movement predates its arrival in Brooklyn, some of the most innovative and dynamic urban farming is being done in that borough. While urban farms address issues of sustainability, nutrition, and “food deserts,” they have always had an educational component to them. BWRC’s first breakfast event of the new semester will be a panel discussion on urban farms along the Brooklyn waterfront. The panelists will include urban farmers and educators: Ben Flanner of the Brooklyn Grange, Mara Gittleman of KCC Urban Farm, and Mark Hellerman and Diana Mincyte of City Tech. The event is Free and Open to the Public. However, reservations are strongly encouraged.